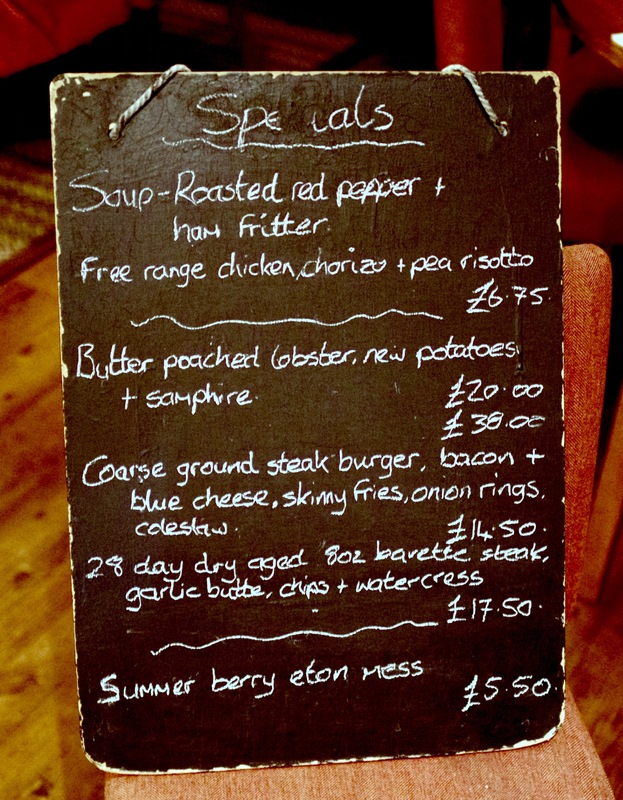 Lobster Season comes to The Richard Onslow. The Richard Onslow, Cranleigh celebrated Lobster season this August with the arrival of fresh native lobster every Thursday, Friday and Saturday night. The season started with classic lobster thermidor, lobster, pink grapefruit and avocado salad, grilled lobster with garlic butter and fries and finally butter poached lobster. Surrey Kitchen was lucky enough to be invited to sample the butter poached lobster during the last weekend of the month. What makes the Richard Onslow’s lobsters so special is that they come from Rob Adams who is one of the most experienced lobster fishermen in Devon. Rob who was born and bred in the famous village of Brixham heads out to sea at the crack of dawn in his small day boat ‘The Little Pearl,’ and inspects the lobster pots he has set on the seabed. All catches are rushed back to the shore and delivered to the Onslow the very next day. 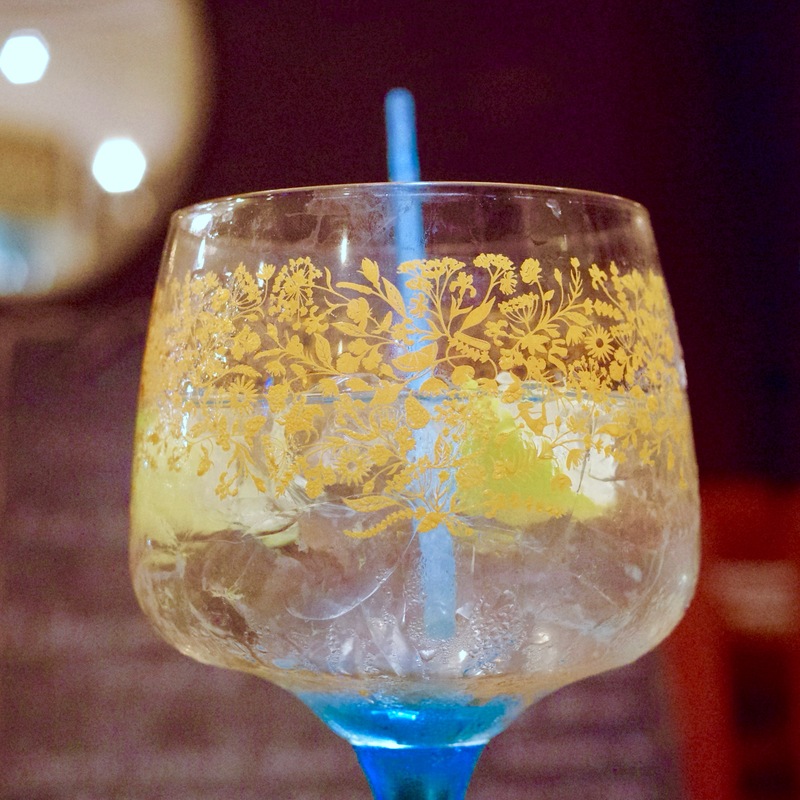 The perfect gin and tonic for a tired mother of a one year old! The butter poached lobster was thick and meaty and packed with flavour. 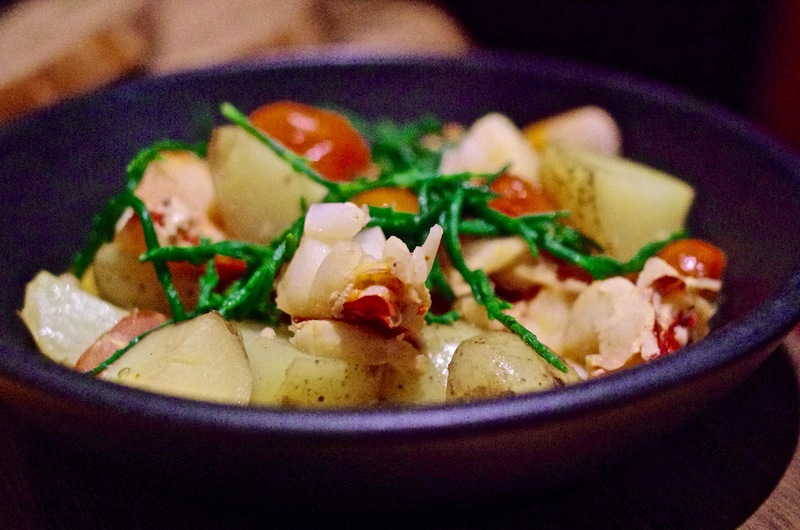 The new potatoes, cherry tomatoes and samphire are a delicious accompaniment. There’s a wow factor to this lobster simply because it’s native and undeniably the best there is. 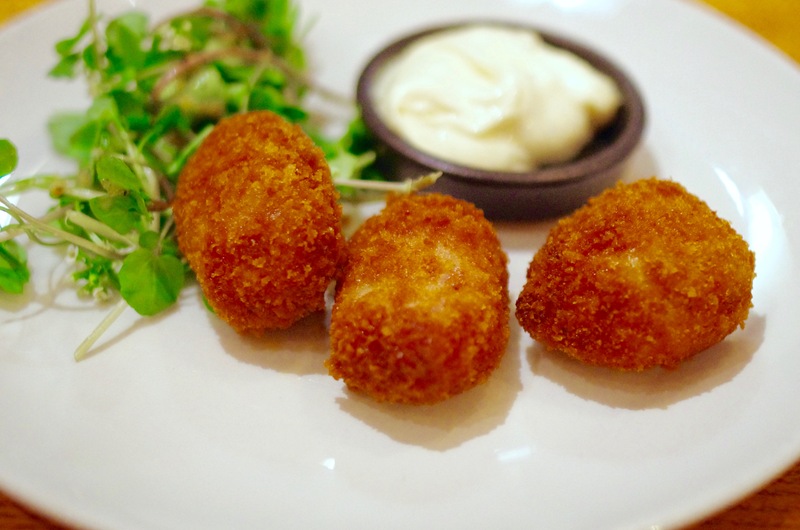 I can’t recommend the free range ham and cheddar croquettes served with garlic aioli enough. They are crunchy, rich, cheesy, everything you would expect from a good croquet, but it’s the quality of the ham that makes them outstanding. Sourced from Aubrey Allen, the Queens butcher the ham is thick and juicy. 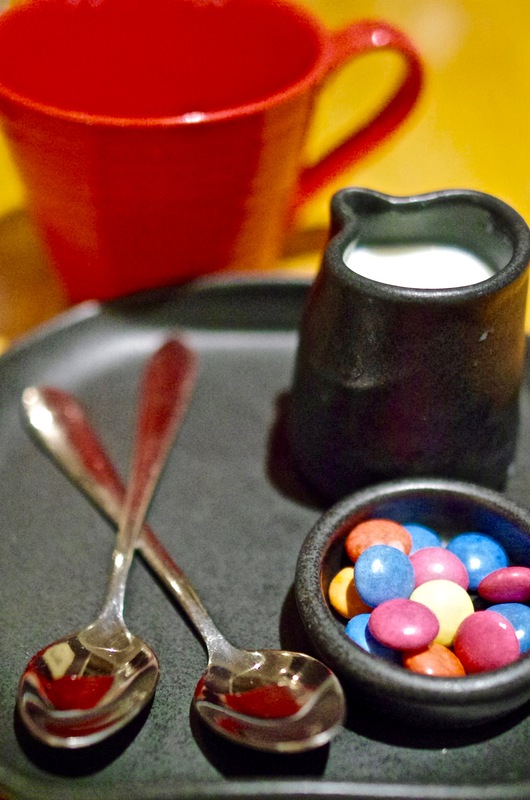 I was forced to devour these as quickly as possible to keep them from my husband who had terrible food envy after opting for the soup to start. 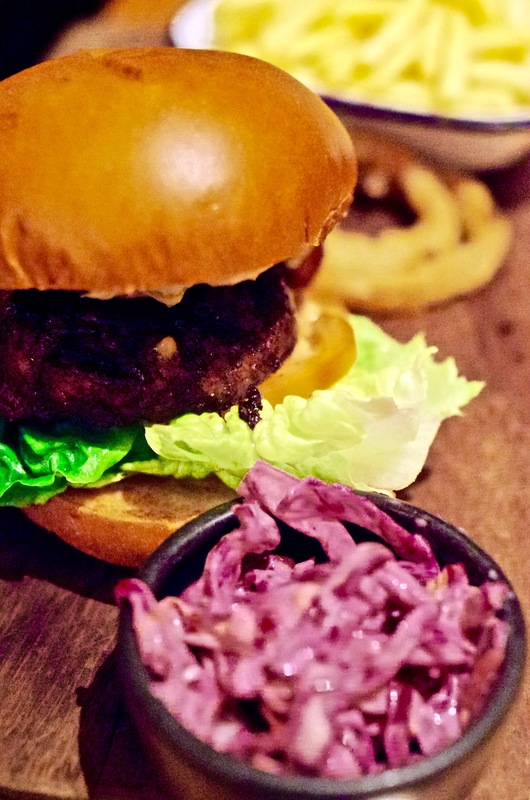 Ross did eventually crack and opt for the coarse ground steak burger, bacon and blue cheese, skinny fries, onion rings and coleslaw to celebrate national burger day. According to ‘husband logic’ one healthy course makes up for a not so healthy course later on. Lol! The steak is again sourced from Aubrey Allen, ground by hand and formed into patties. Now it was my turn to have food envy and after managing to wrestle the burger away from my husband for a quick sample I’m pleased to say the beef patty was perfectly grilled and ridiculously juicy. A big, meaty delight worthy of celebrating National Burger Day. 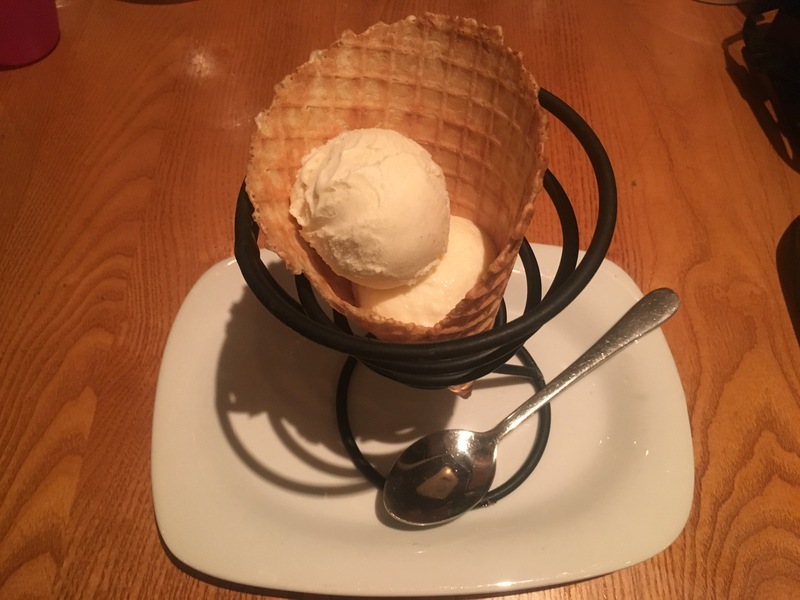 I was keen to try the gin and tonic ice cream from Jude’s in Hampshire. The delicate botanical blend of Sipsmith is perfectly highlighted in Jude’s classic creme angles ice-cream capturing the taste of summer in a scoop. With Lobster season now behind us there’s still lots to look forward to this Autumn at The Richard Onslow. Firstly on the 30th September is the Macmillan coffee morning. Union coffee roasters are launching a new single blend coffee, free for customers to try. If you’re a ‘Great British Bake Off’ fan then this is your chance to enter one of your own cakes in a friendly baking competition. Cakes will be sold to raise money for Macmillan cancer. The Autumn menu looks just as mouthwatering as Lobster season with air dried duck and blackberries, sourced from Capreolus Fine Foods in Dorset. Also on offer will be my favourite comfort food lamb and rosemary pie with herb mash. 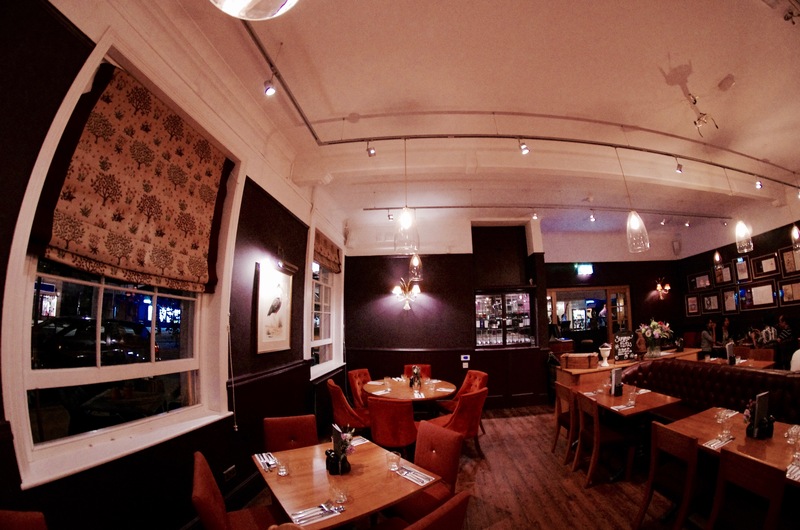 Outstanding food and drink aside what makes the Richard Onslow so special for me is the team of friendly, knowledgeable and attentive staff who work there. I would like to say a big thank you to Terri (manager) who went out of her way to cater for our one year old daughter Alice who wasn’t on her best behaviour all of the time. Thank you for your patience and the loan of the very good looking young waiter who helped to charm Alice. Terri also wanted me to share her excitement at the arrival of Judes moreish chocolate orange ice cream this Autumn. Now if thats not a reason to pop into The Richard Onslow this September then I don’t know what is?